Monkey Kung Fu was developed by Wang Lang, who had already forged the Praying Mantis kung fu system, found yet another breakthrough while walking in the forests in the mountains. He saw monkeys picking fruits from a tree. As quietly as possible, he approached the tree, yet before he could reach it the monkeys saw him, and instantaneously jumped away. Without thinking, Wang Lang raced after them using his well-trained â€œnimbleness techniqueâ€. Amongst the trees, the monkeys rolled, trotted and jumped, and he was soon left far behind. Panting, Wang Lang wiped off his sweat and laughed. Thinking back to what he had just seen, he imitated and analysed the monkeyâ€™s leg movements. They were exactly what he had been searching for! 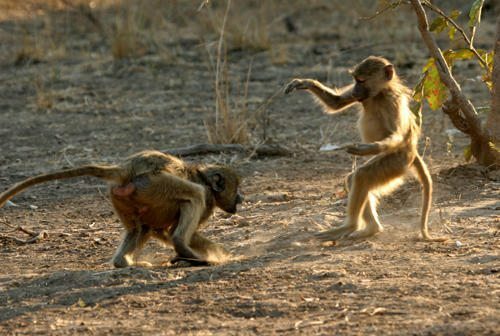 and thus Monkey Kung Fu was formed. The way the monkeys advanced, retreated, dashed, jumped and turned, proved to be more alive than all the big steps and broad stances used in all the other martial arts of that time. From these observations, he designed the â€œMonkey stepsâ€ which are characterized by narrow paces and quick legs. This would enable better speed and spirit in moving. The â€œEight Basic Stancesâ€ were combined with the well known â€œThirteen Arm and Hand Techniquesâ€. Thus the skill of the Praying Mantis Kung Fu and the liveliness of the monkeys was joined.